US Director of National Intelligence James Clapper has announced he has submitted his resignation. Clapper said last year that he would step down at the end of President Barack Obama’s final term in office. 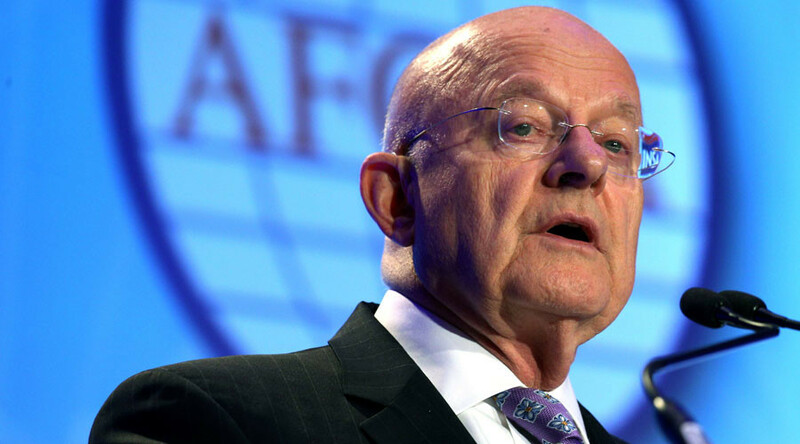 In his resignation letter, Clapper said that his more than 50 years of service was enough. "I submitted my letter of resignation last night which felt pretty good. I've got 64 days left," Clapper said during a House Intelligence Committee hearing on Thursday. Clapper’s resignation comes as the incoming administration of President-elect Donald Trump begins discussions on cabinet appointments. As required of all appointed Administration officials, DNI Clapper has signed a letter of resignation effective at noon on Jan 20, 2017. There is "no reason to question" FBI Director James Comey for disclosing the Bureau's renewed investigation of Hillary Clinton's emails a week before the election, Clapper told the lawmakers. Clapper was sworn in as the fourth Director of National Intelligence (DNI) in August 2010. During his tenure as director he has often been required to defend the position of the National Security Agency (NSA). In a famous exchange in March 2013, Senator Ron Wyden (D-Oregon) asked Clapper, "Does the NSA collect any type of data at all on millions or hundreds of millions of Americans?" Clapper answered, "No, sir... not wittingly." Just two months later, NSA whistleblower Snowden left the US with 10,000 documents exposing the extent of government surveillance. Snowden's files showed that the NSA was indeed collecting telephone metadata of millions of law-abiding Americans. Clapper was never charged with lying under oath, however. Senator Wyden, a leading critic of unchecked intelligence powers, spoke out about Clapper’s resignation. “During Director Clapper’s tenure, senior intelligence officials engaged in a deception spree regarding mass surveillance,” said Wyden, a champion of civil liberties advocates in a released statement issued on Thursday over the announcement of his resignation. Wyden said even with the disclosures of Edward Snowden, Clapper’s office refused to correct the record. His office offered a number of explanations for the “misstatement” including he forgot about the phone records program and he had offered the “least truthful” answer because it was in an unclassified setting. “Regardless of what was going through the director’s head when he testified, failing to correct the record was a deliberate decision to lie to the American people about what their government was doing. And within a few months, of course, the truth came out,” said Wyden. Clapper spent 32 years in the US Air Force, retiring in 1995 with the rank of Lieutenant General. His last post was as Director of the Defense Intelligence Agency (DIA). He then spent six years in the military industry, before returning to head the National Geospatial Intelligence Agency from 2001 to 2006. He briefly taught at Georgetown University before President George W. Bush appointed him undersecretary of defense for intelligence in 2007. The position of Director of National Intelligence was established under the Intelligence Reform and Terrorism Prevention Act of 2004, following a recommendation by the 9/11 Commission. The commission had identified major intelligence deficiencies over the 9/11 attacks and failures of the intelligence community to be able to protect US interests against foreign threats. The DNI is the principal adviser to the president on intelligence matters related to national security, and directs and oversees the National Intelligence Program.